Generating Productivity – Mobile Workplace System means you can achieve the same amount of volume with fewer pieces of equipment (i.e. computers, printers, scales, test equipment, etc.) by converting to mobile workstations. Improving Processes– The Mobile Power System allows you to fully leverage your wireless facility by cutting the power cords and letting your workstations move to where they are needed – with your people. Speed of Information– Operators & managers now have access to real-time data anywhere in the facility because they can take their workstation with them. Maximize the value of your ERP and MES implementation and reduce your reliance on “paper”. Instant Mobility– Obtain measurable productivity gains by significantly reducing wasted motion without months of planning and implementation. Workstation is delivered and ready to use the same day. Designed with Safety in Mind: Our mobile workstations are ergonomically designed and safe while rugged enough for any facility. 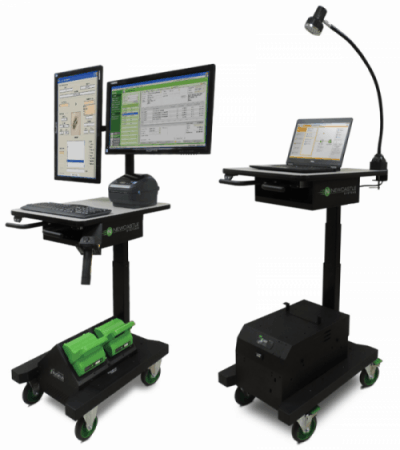 Mobile power is a movable, flexible, ergonomic and battery-powered workstation that allows manufacturing floor workers to hold and power computers, printers, scanners and more on a portable workstation that moves along with them throughout their tasks on the floor. Mobile powered carts provide many benefits and make an immediate impact once they enter a manufacturing facility. Most importantly, the workstations reduce waste in a major way. What kind of waste are we talking about? Some waste is hard to see as it has always been ingrained in everyday activity on the manufacturing floor. Here is an outline of the waste that mobile powered workstations reduce. Wasted steps: Yes, walking is very much a form of waste on the manufacturing floor. Workers on the manufacturing floor are walking all day, and each unnecessary step is wasted time and energy. 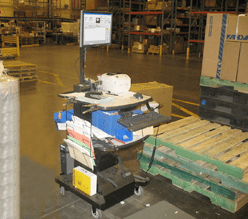 When mobile powered workstations are implemented on a manufacturing floor, steps are greatly reduced as workers no longer need to walk to fixed printers or computers—everything they need is right with them, and its mobile. Wasted touches: Minimizing touches of all goods entering and exiting the manufacturing floor is essential in reducing waste. Every touch is costing a manufacturing floor time, which in turn costs money. 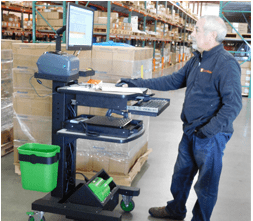 Mobile powered stations condense all equipment into one moveable spot, so any labeling and tedious measures can all be done in one spot without unnecessary process steps. Wasted equipment: Mobile powered workstations let manufacturing plants achieve the same level of output, with fewer pieces of equipment. Printers, scales, test equipment and software can all be included in a mobile powered workstation. Wasted staff turnover: Work on the manufacturing floor is a tough, physical job. Add in the pressure to do everything in a timely manner and you have jobs with a high turnover rate. Adding in mobile powered workstations will help staff members complete their tasks faster with less walking, both advantages in staff retention goals. The workstations also enable operators to access real-time information anywhere in the facility because of the mobility of the workstations, a major asset when tracking production. Contact us today for more information, visit our website section, or to schedule a no-obligation site visit!